The house I grew up in is so close to Mexico you could walk there at a leisurely pace in about 40 minutes, my Mexican grandmother practically raised me, my childhood diet contained plenty of beans, corn and chile, summers and weekends were often spent in Mexico, and my life as of late has revolved around human rights in Mexico, but for some reason I have a hard time claiming my “latina” identity (though I’ve tried). For a long time I thought it was because those who grew up on the other side of the fence were always very quick to point out how much of a gringa I really am. That is definitely part of it, I mean I AM very Amurican, but then when I moved away from the border I saw people who spoke less Spanish than me who grew up farther away from Latin America identifying very strongly as “latinos”. Honestly, at first it annoyed me, but I have come to realize that the reason they were more able to identify than I was was because they had been “othered” more than I had and perhaps fit the cultural stereotype better. I can’t really relate to brown pride (I turn red waaaay before I turn brown) and though the Virgen de Guadalupe is a cultural icon, as a Jew, she means very little to me. I’ve also never been turned down/away from anything for being hispanic, don’t really have to worry about being unjustly incarcerated (my dad is an attorney) and generally blend in almost everywhere I go. I guess I feel it is important to write this because the idea of what it means to be Latino, Mexican-American/Latin American in the United States is very narrow. We’re not all poor, brown and uneducated. Some of us really don’t face much adversity at all. I got the idea for this entry when I went to go visit my pale-skinned, green eyed, redheaded, Mexican grandma. When I walked in the door she was reading an analysis my grandfather had written about Pedro Páramo in the 1950s or 60s. Pedro Páramo is a masterpiece of Mexican literature written by Juan Rulfo and though a difficult read one of my personal favorites. 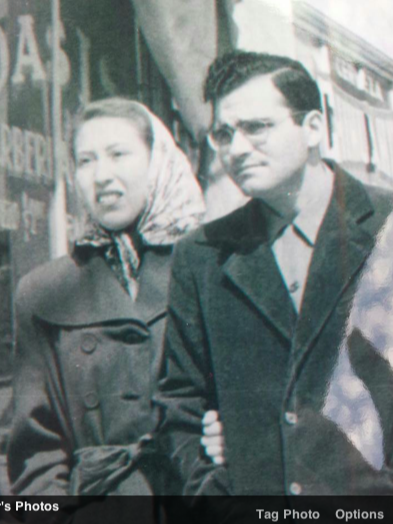 My grandfather was an immigrant to Mexico a few years after WWII where he met my grandmother and if circumstances would have allowed they would have started a family there. So when my dad and his siblings were growing up it was very important they learn Spanish and spend summers with their grandparents in Mexico. So at a time when Mexican parents were trying to assimilate their children my grandparents were taking courses in Latin American literature and my grandfather was trying to assimilate as much as he could into Mexican culture. I held that essay in my hands and read my grandfather’s impeccable Spanish and was grateful for all of the privilege my bicultural upbringing had given me. How lucky I am to have been able to read Neruda, Borges, Marquez and Pizarnik in their original language and to be able to understand the lullabies my grandmother sang to me. I am lucky because I can communicate with a whole continent and have friends and family in Mexico and South America who have opened their homes and hearts to me. I’ve also gotten jobs and opportunities I otherwise would not have qualified for just because I speak more than one language. As stated–I’m pretty white so maybe this is just an extension of white privilege, but the point is we shouldn’t just assume Latin Americans don’t have access to that privilege. All of the Americas are basically melting pots of cultures, languages and experiences and we should not forget that. I mean where do you think a guy like Ted Cruz comes from? Amuricans aren’t the only imperialist assholes. After all this I still don’t strongly identify as a “latina. I’d say it is my Jewishness that most defines me because growing up I experienced quite a bit of anti-semitism and was not allowed to not be Jewish. So perhaps it is otherness that defines us? I also wonder if I had never been othered if my identity would be such a preocupation. We’re all just mammals, right?